I’ve just received final proofs for my chapter, “Cloud Collaboration: Peer-Production and the Engineering of the Internet.” This chapter, which will appear in the book titled “Engineering Earth,” has gone through a few incarnations (and indeed titles). 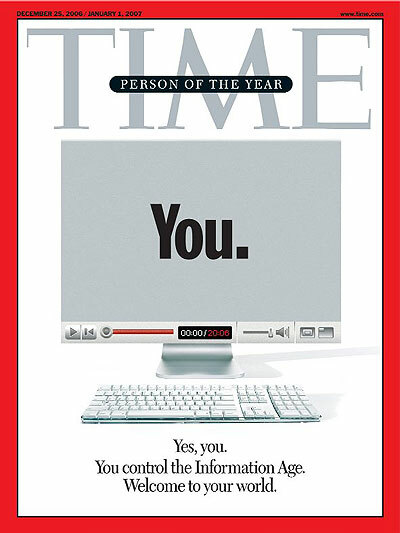 But this version will absolutely, certainly, be the final draft. The full citation is below, and I welcome any feedback. The following maps represent the first stage of a project I am embarking on to map out some of the spatial contours of Wikipedia. Data were obtained from the August 2009 Wikipedia geodata dump organised by user Kolossos. The information was then ported over to a GIS. 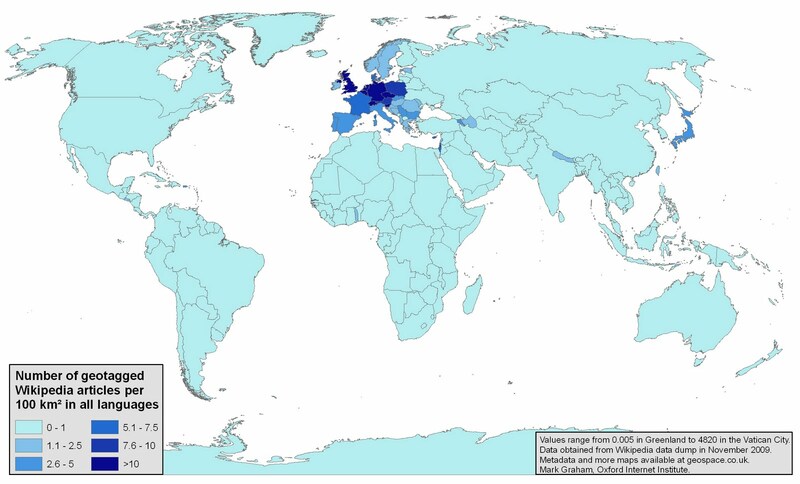 There are almost half a million geotagged Wikipedia articles (i.e. Wikipedia articles about a place or an event that occurred in a distinct place), so the preparation time alone for the files needed to create these maps was almost a week. 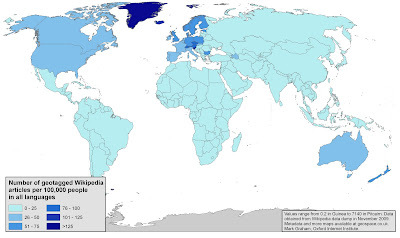 The map below displays the total number of Wikipedia articles tagged to each country. The country with the most articles is the United States (almost 90,000 articles). Anguilla has the fewest number of geotagged articles (4), and indeed most small island nations and city states have less than 100 articles. However, it is not just microstates that are characterised by extremely low levels of wiki representation. 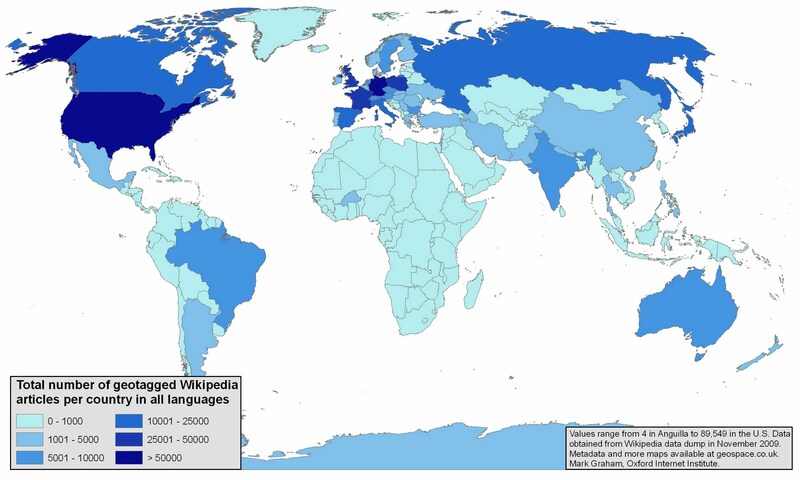 Almost all of Africa is poorly represented in Wikipedia. Remarkably there are more Wikipedia articles written about Antarctica than all but one of the fifty-three countries in Africa (or perhaps even more amazingly, there are more Wikipedia articles written about the fictional places of Middle Earth and Discworld than about many countries in Africa, the Americas and Asia). When examining the data normalised by area, an entirely different pattern is evident. Central and Western Europe, Japan and Israel have the most articles per landmass, while large countries like Russia and Canada have low ratios of Wikipedia articles per area. As I’ve previously argued, Wikipedia is an important component of the palimpsests of place. In other words, presences and absences play a fundamental role in shaping how we interpret and interact with the world. The fact that the geographies of Wikipedia content are so uneven therefore leads to worrying conclusions. As we increasingly rely on peer produced information, large parts of the world remain ‘terra incognita’ (in a similar manner to the ways in which many of those same places were represented on European maps before the 19th Century). However, it is conceivable that it will only be a matter of time until the empty spaces on the Wikipedia map are filled in by Wikipedians in Zambia, Indonesia, and much of the rest of world. These data certainly warrant a closer look, and I’ll aim to get more maps (examining the distribution of content in specific languages, and looking in more detail at specific regions) uploaded soon. “The way the street feels may soon be defined by what cannot be seen with the naked eye. Imagine film of a normal street right now, a relatively busy crossroads at 9AM taken from a vantage point high above the street, looking down at an angle as if from a CCTV camera. We can see several buildings, a dozen cars, and quite a few people, pavements dotted with street furniture. Freeze the frame, and scrub the film backwards and forwards a little, observing the physical activity on the street. But what can’t we see?